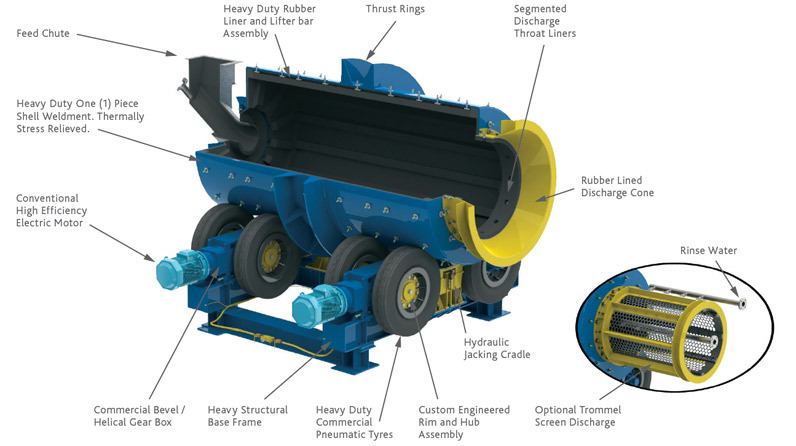 Sepro Tyre Drive Scrubbers feature a rugged, simple design and incorporate robust components to deliver low capital and operating costs combined with high availability. 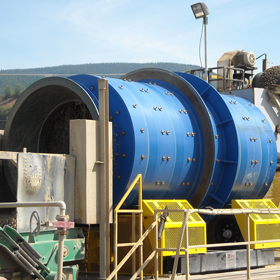 Operating in many applications on feeds with high clay contents, Sepro Tyre Drive Scrubbers are well proven as the optimum choice for difficult mineral ore and stone washing duties. The variable frequency drive (VFD) package accompanying each unit allows you to fine tune the operation of the scrubber based on the application. No auxiliary drive is required to perform maintenance. Sepro Tyre Drive Scrubber shells are manufactured in one piece to high quality standards and are thermally stress relieved to eliminate localized high stress areas. The machine utilizes the Sepro Pneumatic Tyre Drive System (PTD) which provides an alternative to standard chain and gear drive scrubber systems. This system of rubber tyres mounted on independent gear boxes provides excellent serviceability and reliability, having been well proven in numerous difficult applications. An instrumental feature accompanying Sepro’s tyre driven equipment is the tyre pressure monitoring system (TPMS) which comes standard with each Sepro rotary control console. 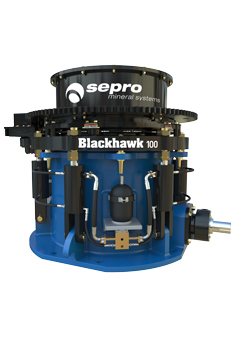 Sepro operates pilot scale facilities, which generate reliable data for scale up to commercial operation. Pilot scale machines are also supplied for field test purposes. 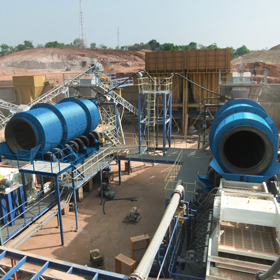 Equipped to match the specifications within a variety of mining plant and circuit processes, Sepro Tyre Drive Scrubbers are dynamic and intensive. 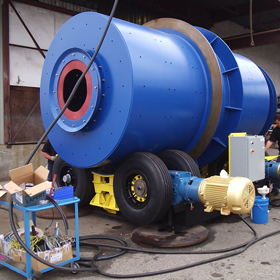 Driven by high efficiency electric motors on a custom engineered rim and hub assembly, Sepro Tyre Drive Scrubbers utilize a high performance tyre drive system to liberate valuable particles or remove clay contamination. 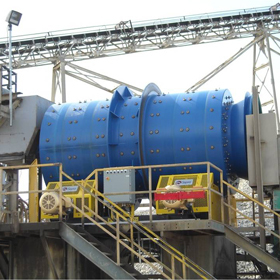 The use of a tyre drive system results in significant maintenance cost savings over time unlike standard trunnion/steel scrubbers wheel drive scrubbers. 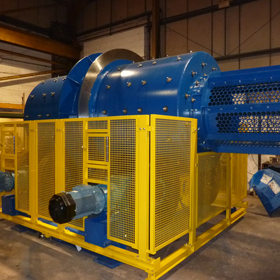 Each model is complete with integral hydraulic jacking cradles and a variable discharge height to control operating pulp levels, all of which can be set by the plant operator based on application and desired discharge output. 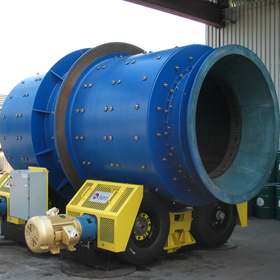 Sepro’s line of heavy duty Tyre Drive Scrubbers utilizes a powerful and rugged Variable Frequency Drive (VFD) package, allowing the equipment operation to be fine-tuned based on the application. The Rotary Control Console (RCC) component features a touch-screen Human Machine Interface (HMI), which is used to control and monitor the operating parameters. 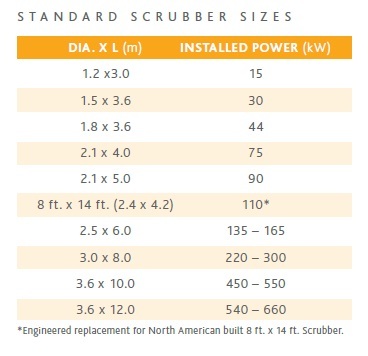 Every Sepro Scrubber AutoPAC comes complete with a jacking cradle, tyre pressure sensors, and hardwired safety limit switches. 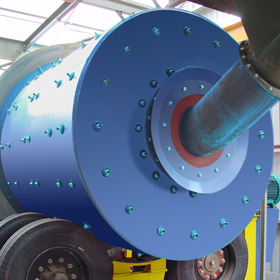 The tyre drive system is a stand-out feature included in Sepro Scrubbers. The drive is built to be simple, effective and low maintenance. 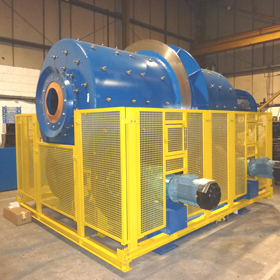 Tyres on the scrubber are designed to be removed individually without complicated shaft, bearing and coupling arrangements. Tyres are carried on purpose built wheel assemblies, which are driven by a bevel/helical gearbox direct connected to the electric motor. Starting and speed control is done via an AC variable frequency drive. 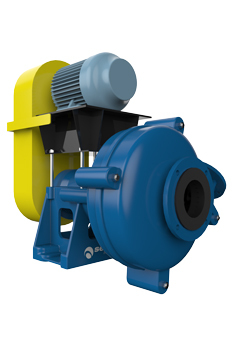 Every Scrubber manufactured by Sepro comes complete with a Tyre Pressure Monitoring System (TPMS). Located within the Rotary Control Console (RCC), the TPMS feature protects the operation from costly downtime due to under-inflated tyres. The system works as a closed loop control, allowing the HMI to disable the VFD should the operating conditions of the equipment stray outside of its defined parameters. Monitoring the equipment’s tyre pressure greatly improves machine performance over time.